...... Power Article Rewriter is simply the best content rewriting system in the world. Period. 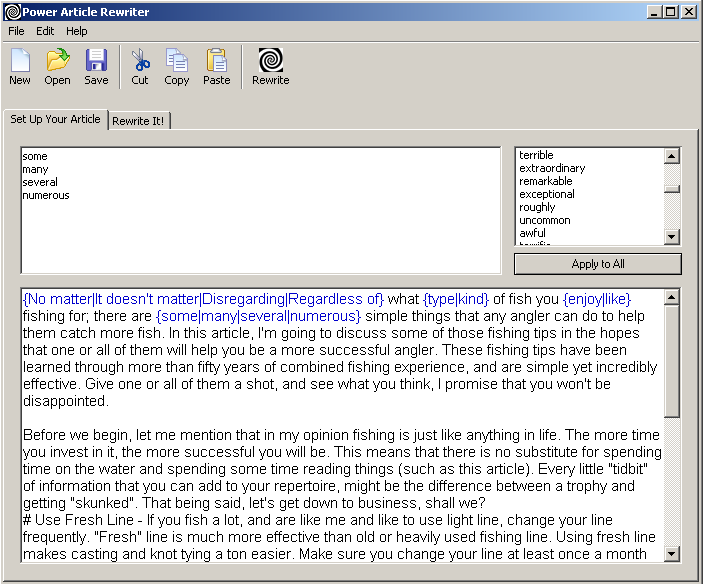 Power Article Rewriter combines all the powerful features of the most expensive rewriting tools with a dead-simple interface that anyone, and I mean ANYONE can learn to use in just a couple of minutes. And Power Article Rewriter's exactly that simplicity that makes it so powerful (don't be fooled though, there's a robust engine working behind the simple interface) . Your time is now spent being creative, rather than trying to work with complicated programs. There's no learning curve. If you know how to copy-and-paste, then you already know all you need to use Power Article Rewriter. In about the same time it took you to write your original article, you can use Power Article Rewriter to create dozens or hundreds of unique versions of that article. Qweas is providing links to Power Article Rewriter 2011 3.0 as a courtesy, and makes no representations regarding Power Article Rewriter or any other applications or any information related thereto. Any questions, complaints or claims regarding this application Power Article Rewriter 2011 3.0 must be directed to the appropriate software vendor. You may click the publisher link of Power Article Rewriter on the top of this page to get more details about the vendor.